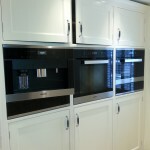 In recent years we have noticed a large amount of enquiries from clients who are in the process of purchasing a kitchen from Handmade Kitchens Direct. 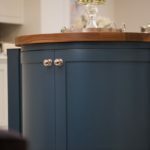 As we have Hand Painted quite a few of there kitchens, I thought i would share my opinion on them and the process we go through to produce a showroom paint finish. 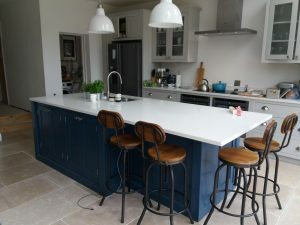 Handmade kitchens Direct have been established since 2001 , There kitchens are Tulip wood framework and MDF panels and are well built and very well priced for a Bespoke Kitchen. 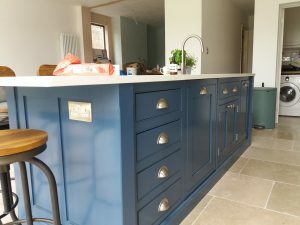 When buying a kitchen like this the two most important factors are the fitting and the Hand Painting, This is where we are here to help, I have been Hand Painting Bespoke kitchens since the early 80s and there is not much i have not seen or had to solve. Christchurch kitchens are unprimed, The first job is to apply a shellac based primer to all areas of bare wood, The reason we use a shellac based primer is not just because it has brilliant adhesion but also is a stainblock, Tuplip wood which the frame work is made from can sometimes stain through the paint film, this primer will prevent that happening, We then rub down the complete kitchen, Fill were required and apply an undercoat, Flated down to a smooth finish we then apply two top coats of furniture paint mixed in any colour of your choice, The final job is to apply a finishing oil to the internal cabinets as they are unsealed. A lot of thought has gone into ways of leaving clients with the minimum of disruption. 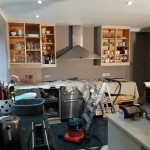 For me the anwser is to remove the doors & drawer fronts and take them away to my workshop. With the frames fully exposed and accessible, I apply the full “Prep and Paint” treatment to everything left in stiu. I then leave the clients in peace to complete the bulk of the work in my workshop . I keep everyone in the loop with process, and return to reinstall the kitchen, Finish any loose ends, Maybe fit new handles and leave the kitchen clean and ready for use. If you need advice on Hand Painting your Christchurch kitchen, I am happy to explain how i would turn your kitchen into the kitchen of your dreams. You can ask for a full no-obligation quote which I will supply free of charge. 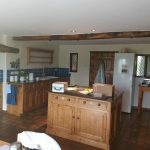 I cover the areas of Northamptonshire, Bedfordshire, Buckinghamshire & Hertfordshire for Traditional Painter.com if you are not in one of these areas click on the find a traditional painter icon at the top of this page.